Growing up in Red Bank New Jersey at the family marina that was established in 1885 Charles learned about boats. Charles started out his marine career by being the lifeguard for Irwin Marine. After doing that for one season he moved up the ranks and became the guy who put hoses in freezing water in mid November and December for the bubble system in order to make sure ice would not form around pilings and boats. Not long after he began scraping boat bottoms with a 2" knife. Almost every phase of the marine industry has been noted on his "what has he done with boats" list. In 1991 on a vacation trip to Dubai Charles obtained his open water certification and later, moved to Florida and received his scuba instructor certificate. Although being in Florida has been nice, he still missed his old days at the Marina. So, Charles begain working for 247 Divers as their Operations Manager and the rest is history. 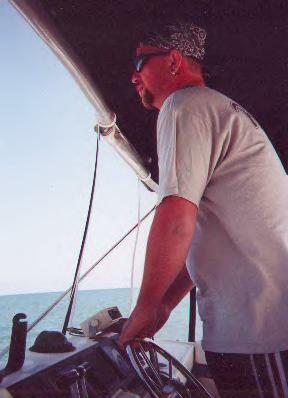 Charles delivering a 40' boat from Fort Lauderdale, FL to Atlantic City, NJ.